I took the B63 bus down 5th Avenue to Green-Wood Cemetery late this morning to check on the cemetery's resident Red-tailed Hawks. 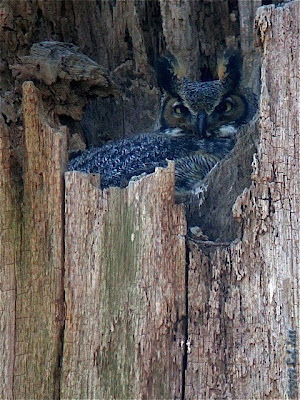 Last Thursday Joe and Marge confirmed that Big Mama and Junior had indeed moved into a new nest. We would meet at the main entrance and Joe would drive us over to see the hawk's new digs. Several Monk Parakeets were feeding along the narrow grass border that parallels the walkway leading to the cemetery's Gothic Revival entrance. The resident colony that nests on the brownstone spires is vocal all year. Now that spring has arrived, they are chattering non-stop, foraging for food, collecting nest material and building or repairing their communal nests. It looked like the avian equivalent of a beehive, only louder. Close by, flocks of Common Grackles have joined the activity, contributing their unique collection of squeaks and squawks to the crescendo of Spring's background music. We stopped at the "Sylvan Water" pond so Marge could deliver some cracked corn to her charges - the four wayward Snow Geese. They usually come running (or limping) the moment they see her, but today they stayed in the water a short distance from the shore. Marge could not understand why they were ignoring her food offering. After a few minutes, it became clear. There was a young Red-tailed Hawk sitting in a tree next to the pond. The hawk eventually flew off and the geese promptly left the water and waddled over to greet their adopted Mother Goose. "Stumpy" looked healthy despite his amputated foot, but was still smaller than the other three Snow Geese. I noticed that "Mommy" (Marge's name for the original injured Snow Goose) still harasses the little one, so he likely isn't getting as much to eat as the others. Joe mentioned that one of the young geese seems to be showing interest in "Mommy". 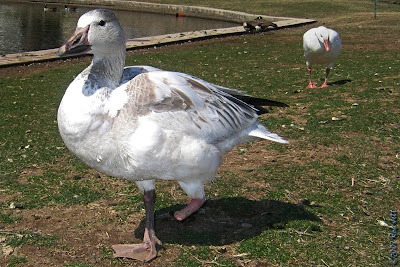 It is a bit premature, but how weird would it be if Snow Geese began nesting in Brooklyn? Would hunting season be far off? I heard the trilling song of a Pine Warbler, then spotted the brilliant yellow bird perched in a Magnolia tree next to the car. A second one, a short distance away, was hawking for insects from a pine tree. There were also several Eastern Phoebes ringing the pond. They were launching short feeding sallies from the pond's stone coping, low fence posts, mausoleum roofs and leafless tree branches. A few minutes after we arrived, Steve and Heidi pulled up next to us. 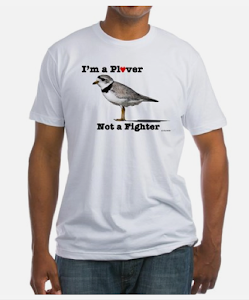 Steve rolled down his window and, with a wide grin said, "Have you seen the pipit?" I thought that he was joking, but, in fact, he had spotted a lone American Pipit feeding in the stubby grass that surrounds the pond. Besides the fact that Green-Wood Cemetery is not a typical NYC location where birders look for these small, brown birds, they are a gregarious species usually seen in the company of other pipits. They are often overlooked during migration, but can frequently be heard making their namesake "pip-it, pip-it" flight call as they pass overhead. The one foraging next to the cemetery pond reminded me of the single Snow Bunting I observed at Gravesend Bay last month. Another lonely arctic bird. 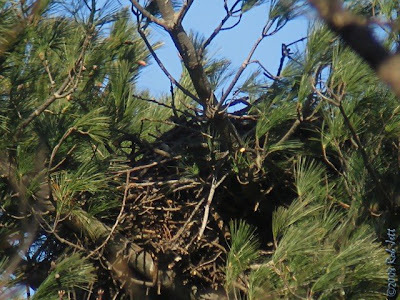 The new hawk nest is about two hundred yards south of last year's nest. Unlike their previous choice (a spindly cedar tree), the base for this year's nursery is near the top of a massive, mature European Elm tree. At the base of the tree is the cemetery's well-known drummer boy grave and monument. In addition to the more substantial base, their new nest is considerably larger than 2007's. Marge and Joe told me that the hawks started work on it last spring, but eventually moved into the cedar tree up the hill to the north. We parked the car on Linden Avenue and Joe walked me to a viewing spot that he had scoped out last week. 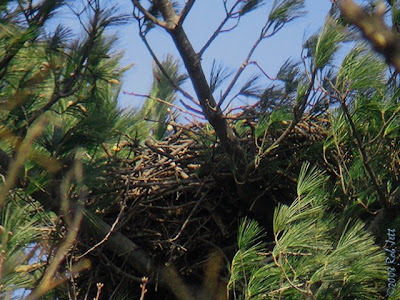 On a hill southwest of the huge elm is an unobstructed view of the nest. When we arrived, Big Mama was sitting motionless within the bowl of the over-sized twig and branch structure. I had a decent view, but the high, harsh midday sun made taking decent photos impossible. At 1:05pm, Junior flew into the nest. He didn't bring any food and just stood over his larger mate, as if he was just checking in. He left after only a minute. I walked around to the hill on the opposite side and located another vantage point that should allow good views of their hatchlings later in the season. Big Mama left the nest at around 1:20pm, flying off towards the northeast. There was a brief, unseen exchange of vocalizations between her and Junior. Moments later, Junior flew to the nest to resume incubation duty. Prospect Park's "Alice & Ralph" and Green-Wood Cemetery's "Big Mama & Junior" appear to be on the same breeding schedule. Barring any unexpected problems, we can expect to see signs of hatchlings during the week of April 28th. Those offspring will be ready for their maiden flights during the week of June 9th. When I arrived in the woods at 3:45PM on Thursday, Alice was sitting on her nest in the pine tree. She barely moved, except for an occasional glance beneath her reposed body. When I departed at 5:10PM, she was still sitting on the nest. 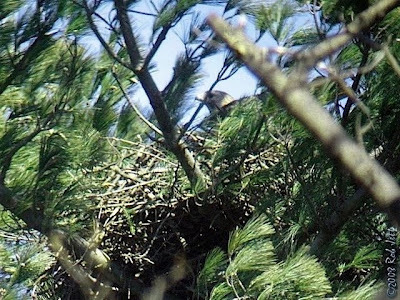 It was the first time this spring that I've seen either adult hawk spend an extended period of time on the nest. That would indicate that there is probably at least one egg in the nest. If all goes well, we can begin counting down the days towards hatching. Despite the cold weather there appeared to be plenty of insects emerging. Arriving Eastern Phoebes were hawking for flies from low perches throughout Quaker Ridge. Several were also actively feeding from high in the canopy. I counted a total of ten. A Brown Creeper methodically probed the deep ridges in an oak tree's bark a few yards from where I stood. Small flocks of juncos were foraging their way north through the woods. Several Golden-crowned Kinglets were following along with the sparrows. I've been fighting off a nasty cold and today I felt well enough to spend some time watching the nest. It was just past noon when I focused my scope on the pine tree. My view is a little better from a new spot I found at the southwest side of the nest. A lice was in the nest, looking out over the ponds and into the bright sunshine. Unlike late Thursday, the woods were nearly devoid of birds. Strong northwest gusts scouring the woods on the west side of Quaker Ridge was the likely reason. At 2:05, the bulky, dark Red-tailed Hawk stood up, straightened her back and stretched. She remained standing until 2:21PM, when I heard her mate calling. Alice took off, flying south. I lost her in the sun, but heard the pair's greeting chirps. After a minute or two Ralph flew into the nest to resume incubation duty. A few minutes later, she called and I spotted her just above the trees near the lower pond. He left the nest and the two hawks circled close together above Quaker Ridge. Carried by the strong wind, they gradually soared out over the Nethermead Meadow and out of my sight. I packed up my gear and I birded the woods on the east side of the two ponds before heading home. The wind had died down a little and there was a small, mixed flock of songbirds feeding in the woods near the Lower Pool. 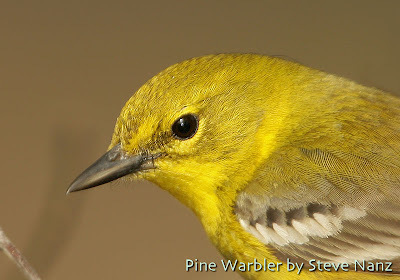 Among them was my first sighting of a Pine Warbler for the year. Before I left the Ravine I looked back at the nest. At some point while I was looking at the little birds, Alice had returned and was sitting on the nest. 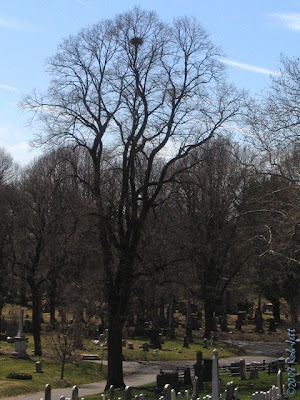 Tomorrow I'm going to Green-Wood Cemetery to check out Big Mama and Junior's new nest. 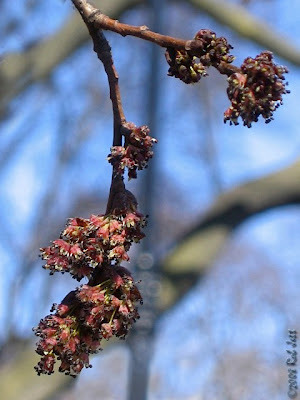 Marie, a regular reader of this blog, just posted a short piece on her blog about that mystery early-blossoming cherry near Grand Army Plaza. I've looked at that tree nearly every Spring for the last 12 or more years, but I think this March was the first time that I photographed its flowers. Marie has some great photos of botanics on her blog, so I'll be checking it out a lot now that Spring is here. I had about 90 minutes at the end of the day to run up to the park. I love taking late day photos, especially at this time of year. The sun is still relatively close to the horizon, creating long shadows and gentle, warm tones. I planned to walk up to Grand Army Plaza, check for the kestrel, then walk back across the Long Meadow to the Ravine hawk nest. I figured that, even if I missed both raptors, there's always something interesting to see during the early Spring. Elm trees have begun flowering and there's a beautiful specimen at the edge of the park drive near Garfield Place. Festooned with black and pink blossoms, some of its lower limbs droop low to the ground. I stopped to take some photographs. As I was examining the branches a tree pruning truck slowed, then came to a stop on the opposite side of the road. "What are the odds", I thought (and possible even said aloud). Fortunately, there was no work order for that elm tree and the truck eventually began to move and continued down the road. 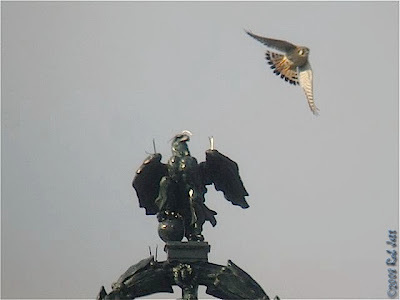 The kestrel didn't visit the "Soldiers and Sailors Monument" during the brief time that I was watching. I did catch a glimpse of him northeast of the plaza, flying over a building near Vanderbilt Avenue. On my way to the Ravine, I scanned through flocks of robins and starlings that have gathered to feed in the grass along the meadow. I had just passed a stand of pines on the east side of the field when dozens of robins suddenly took flight. Some landed in the few trees that dot the edges of the meadow, others just kept going. One of the birds must have sounded an alarm because, moments later, a large Cooper's Hawk cruised passed. She was less than six feet off the ground and wove a path between a pair of River Birch saplings, around some budding magnolias, then across the road and into the trees that surround the Vale of Cashmere. The speedy hawk passed a few people sitting on park benches, but they either didn't notice or weren't impressed. Sometimes it takes an extraordinary effort to get a New Yorker's attention. I thought that fleeting experience was going to be the highlight of my walk because the subsequent time that I spent at Alice and Ralph's nest was uneventful. Neither hawk made an appearance. 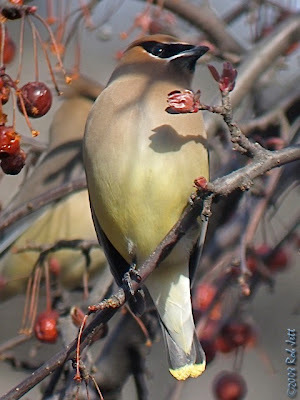 As I was exiting the park at 5th Street, I heard the high, thin whistles of Cedar Waxwings. They are gregarious birds that are usually easy spot as they rarely travel alone. There were about 50 birds in this flock, the largest I've seen in Prospect Park for a long time. They were perched in a maple tree on the south side of the park entrance above 4 unidentified fruiting trees. Birds always ignore the abundant, bright red fruits of these trees throughout the winter. It isn't until the early Spring that birds finally begin to eat them. Perhaps it takes 3 months of fermenting on the tree for them to soften and become digestible. The waxwings gradually got up their nerve and began decending to the fruit trees. Soon flocks of robins joined the feeding frenzy and the trees that had been decorated soley with bright, red fruit ornaments were accented with splashes of yellow, olive, orange, rust and gray. In that brief moment in time, those small, leafless Spring trees became more colorful than any Autumn trees I've ever experienced. 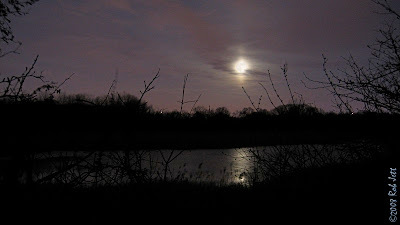 Friday night was going to be a full moon, so I decided to go back over to the Ridgewood Reservoir at the end of the day. The weather forecast called for clear sky and I thought the moonshine would make a nice backdrop for observing the woodcock courtship. I arrived about an hour before sunset and strolled around the running path for about 20 minutes. Red-winged Blackbirds have just returned and the reeds that surround basin #2's lake were ringing with choruses of "conk-a-ree, conk-a-ree". American Robins have also returned and invaded the reservoir in astonishing numbers. There were so many vocalizing birds present that I heard them well before I saw them. Along the grass hillside parallel to Highland Boulevard, at the edges of the running path, in the parking lot on Vermont Place and perched in nearly every tree, there were robins. Some were singing the familiar "cheerily, cheerio, cheerily" Spring anthem, but most were making nervous "whinnies" and "tut, tut, tuts". Maybe they weren't in the cheery Spring spirit yet because of the cold wind blowing across the top of the ridge. Much of basin #3's understory is dominated by weedy plants, but there are a few scattered damp, grassy meadows. Before it was too dark, I headed for one near the basin's north half. As I approached the opening a woodcock flew ahead of me. I found a spot at the edge of the grass that wouldn't disrupt the birds display routines. In retrospect, since I've never been a woodcock, I might have unknowingly sat down in center stage. While I was waiting to hear the first nasal "peent", several dozen panicked robins began scattering through the woods. A Sharp-shinned Hawk had snuck in from the east side of the basin and was cruising through the trees looking for dinner. She made a tight right turn in front of me and continued flying towards the north end of the basin. At around 6:30PM I heard the first male woodcock calling from an area about 50 yards to my right. There was a curtain of dried mugwort plants between us, so I couldn't see him or the object of his affection. A moment later something landed in the grass a couple of yards from my outstretched legs. It was a woodcock. She glanced over at me a few times, but just went about her business probing the soil for worms. As the forest descended into darkness I caught a glimpse of two or three more silhouettes fluttering to the ground on my left. The moon didn't rise early enough that it created much illumination within the basin. Even if it did, I wouldn't have been able to see much of the display's climax. The wind had been gusting from the west across the top of the basins. The woodcock's normally vertical flights had been replaced by an improvised horizontal choreography. Several times I saw them rocketing past my seat at the edge of the meadow. I'm surprised that they didn't collide with any trees. On my way back to the subway I stopped to stare at the brilliant orange-pink moon reflecting off of basin #2's lake. At 7:08PM the Red-winged Blackbirds were still singing and it reminded me of summer's long days. As I stepped onto the pathway that leads into the Ravine, Ralph flew out of the woods and directly over my head. His narrow, finely streaked belly-band and washed out facial feathers make him easy to identify. I was walking toward his nest tree, he was flying towards the south end of the Long Meadow. I spent the next 90 minutes watching the hawk nest, but, other than my initial encounter, didn't observe either Ralph or Alice. The only late afternoon activity that I noticed in their nest woods was a male and female Hairy Woodpecker calling to each other as they chiseled away at adjacent trees. 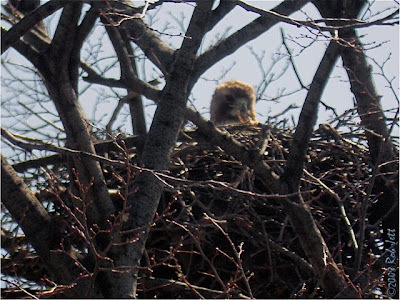 I photographed the empty Red-tailed Hawk nest and compared it to the image I took on the 17th. The hawks appear to have added more branches, so they are probably still using it. I suppose I've just had bad timing with respect to viewing their activities at the nest. From the Ravine, I walked north along the Long Meadow to Prospect Park's main entrance at Grand Army Plaza. There's a narrow lane divider and crosswalk between the loop roadway's entrance and exit at the top of the park. I set up my scope at that location as it affords views of both the "raptor perch" on the monument and the roof top of One Plaza Street. I was optimistic that I'd be able to witness a kestrel entering a nest hole somewhere on the apartment building. A more realistic expectation was that I'd be able to take some photographs of one perched on the plaza's monument. A third, and eventual outcome, had never crossed my mind - that neither would occur. In spite of that, I never consider observing nature a waste of time, so I made the best of my time outdoors. On the east and west side of the road are several ornamental cherry trees. Most of the trees are "Kwanzan Cherry" that will not reach peak bloom flower for another month. There is also one similar, unidentified tree, with rich fuchsia buds that have already begun to blossom. It is likely an ornamental hybrid cherry, but I'm not sure. Most people entering or exiting the park didn't seem to notice or care that I was focusing a telescope towards the monument. Occasionally, someone would look at me then glance up at the monument, but that was the extent of their interest. At around 4:45PM a young girl with wavy red hair walked passed slowly, then stopped to watch me. I smiled. She flashed a silvery, braces bejeweled smile then looked at me quizically as if to say, "What are you looking at?" Without prompting I said, "Nothing, actually, well, at least, not at the moment." I explained about the falcon, to which she asked, "Peregrine Falcon?" When I told her that it was an American Kestrel she was surprised as she had assumed that Red-tailed Hawks were the only local raptors. Her name was Sarah and she looked to be about 15 or 16 years old. Frequently, strangers who notice my binoculars will ask me about hawks or just birds in general. More often than not, their questions, from my perspective, show a disturbing lack of awareness to ones surroundings. The nature of Sarah's questions indicated that, for a New Yorker, she had an above average awareness and interest in her urban environment. She wasn't a birdwatcher, but explained that she loved all animals. As we were talking I noticed a pair of crows chasing a raptor in the sky over One Plaza Street. It was a juvenile Cooper's Hawk. As the hawk flew closer to the park I handed Sarah my binoculars. 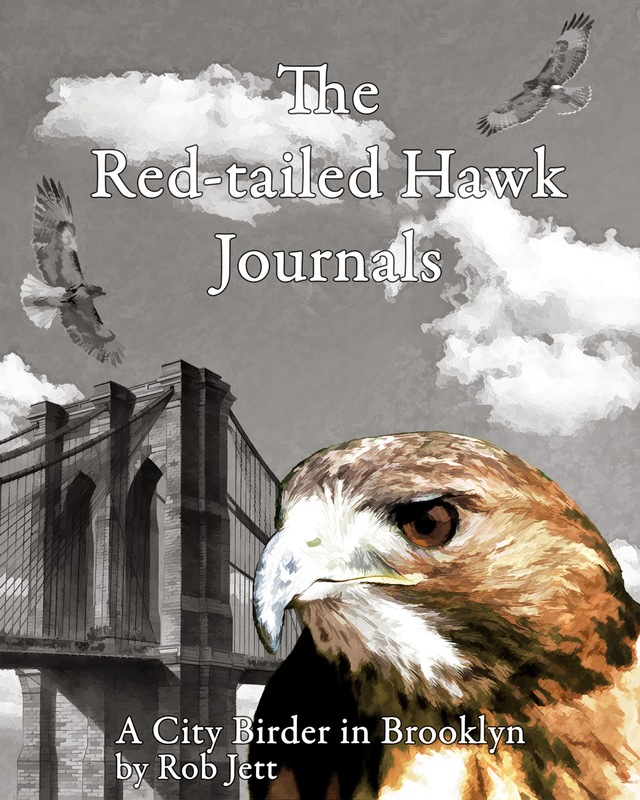 She seemed genuinely excited by the new creature and asked how it differed from a red-tail. The Cooper's Hawk disappeared from view as it flew over the Brooklyn Public Library, towards the botanic gardens. A few minutes later I packed up my gear and began walking with Sarah towards the Long Meadow. We crossed the park roadway near the Meadowport Arch and walked down the incline to the Long Meadow. We were about 100 yards south of the tunnel at the northwest corner of the meadow when I spotted one of our Red-tailed Hawks flying low over the field. I put my bins on the hawk and noticed that it was carrying some type of prey in its talons. It looked like a bird. It was Ralph again, but this time he was heading towards Nelly's Lawn. I gave my binoculars to Sarah. Ralph began to alternately climb then dive for short intervals in a small section of the air near the Vale of Cashmere. It reminded me of the way a child might jump up and down in the waves at the ocean. Perhaps Alice was perched in a tree nearby and that was his way of announcing to her that he had arrived with a dinner treat. He eventually disappeared behind the trees. Sarah handed back my binoculars and thanked me for the impromptu lessons. She continued walking south along the meadow and I crossed the road heading towards 3rd Street. My favorite part of birding and nature observation is being able to share my knowledge with others. Hopefully, I can also transfer some of my energy and passion to that person. Judging by Sarah's enthusiasm, I suspect that, some day when I'm out birding, I'll cross paths with her again, but she'll have her own binoculars. On Tuesday morning, while walking to the subway at Grand Army Plaza, I noticed a kestrel flying overhead. It was heading towards Flatbush Avenue and vanished from view atop One Plaza Street. At about the same time I received a phone call, so I sat down at a park bench across the street from the building. During a 15 minute telephone conversation I kept my eyes pointed at the apartment building's red, ceramic tiled roof. I couldn't see the peak at the top of the 16 story structure, but assumed that's where the falcon landed, as I didn't see him fly out over Flatbush Avenue. It is the same building where I was looking for nesting kestrels last Spring. Last week I photographed a kestrel that was perched on the "Soldiers and Sailors Monument" at Grand Army Plaza. It's a favorite hunting perch for hawks and falcons. I had walked to the north entrance of Prospect Park hoping to find one atop "Columbia's" flagpole. The kestrel was using the statue as a launching point for hunting forays. While I was watching, he took off over Eastern Parkway towards the Brooklyn Museum. During his absence several starlings flew to the top of the monument. They took off several minutes later when they spotted him returning. It was late in the day and, before the sunshine disappeared off of Columbia and her chariot, the kestrel took off. This time he headed down the west side of the park, following the roof line of the buildings along Prospect Park West. I went up to my roof to check if I had a clear view of One Plaza Street. If there is a pair of kestrels nesting somewhere on top of the apartment, I should be able to spot them through my telescope. I don't have any idea how many pairs of kestrels are nesting near the park, but I'll keep an eye on Plaza Street, as well as, the presumed nest location that I learned of last year. 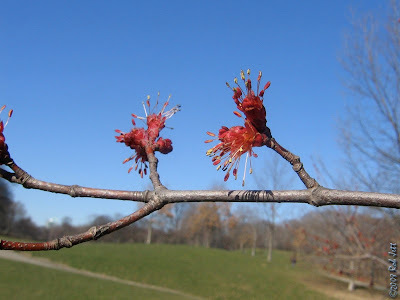 In the last week there has been an explosion of buds and flowers on the city's Red Maple trees. A quick look up into the trees will usually find squirrels dangling from their hind legs, nibbling on the tender, fresh growths. Discarded twig "pick-up sticks" litter the ground beneath the trees. 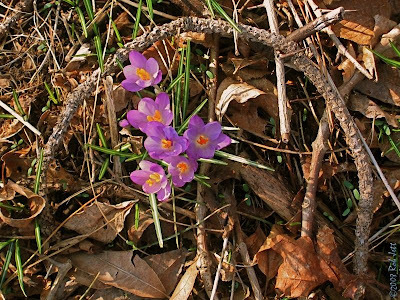 Crocuses have started to emerge and join the delicate snow-drops blooming in Prospect Park's woodlands. The blossoms of Cornelian Cherry Dogwood and forsythia have begun to reveal themselves as a faint yellow haze among some of the park's shrubs. I noticed a tiny drop of sap hanging on the underside of a recently trimmed cherry sapling and it reminded me that Spring has indeed returned. In autumn, the veins that carry sap into and out of a tree's leaves gradually close. The leaves change color, then drop off. 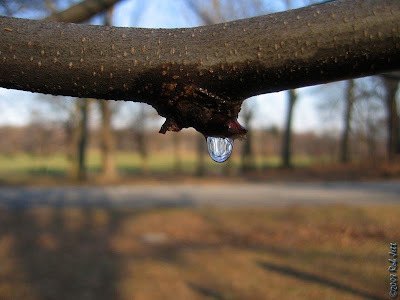 Now, as the daylight hours have increased, the sap has begun to flow back towards the ends of the branches and the leaves with regrow. This afternoon I saw my first Eastern Phoebe of the season in Prospect Park. I guess that means Spring has officially arrived ... at least in my corner of Brooklyn. Another sure sign is that the flocks of Common Grackles that annually breed in Prospect have already laid claim to the park's scattered stands of conifers. 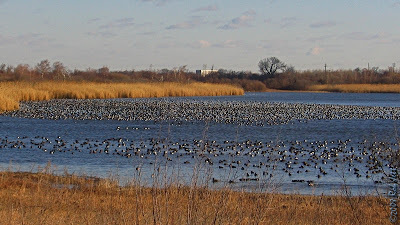 The 300+ Northern Shovelers that overwintered on Prospect Lake have nearly all departed. 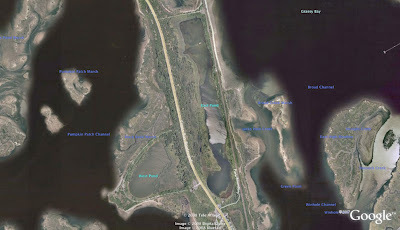 Ruddy Ducks have also been reduced to just two very small flocks at the south end of the lake. One unexpected treat on the water was the arrival of a male Northern Pintail. 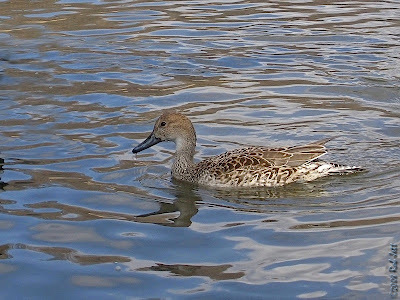 A female pintail spent the winter trying to blend in with the resident Mallards. I guess he spotted her while on a rest stop during his northbound migration. She seems to have acclimated to urban living, readily taking hand outs from humans. The male, however, was reluctant to get too close to shore. He paddled back and forth from a safe distance, watching her every move, while bobbing his head and emitting a high, squeaky whistle. Eventually, he got up the nerve and joined her among the Mallards, Mute Swans, Canada Geese and coots. 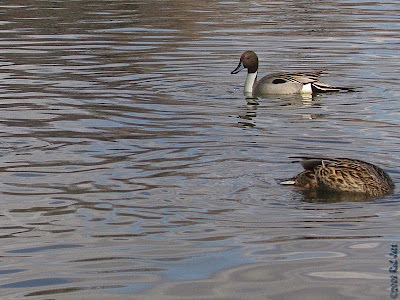 Like most wild waterfowl, pintails usually shy away from humans. The invention of rifles might have something to do with that avoidance behavior. I guess that, for this particular bird, a cute hen and Springtime hormones made the potential risk seem worthwhile. Many of the other overwintering species in Prospect Park are still present and beginning to sing. 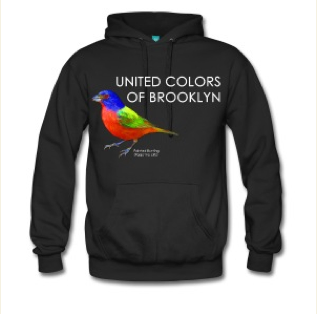 I heard several crooning Fox Sparrows and White-throated Sparrows in the Midwood. Song Sparrows appear to have increased in numbers as there were several dozen spread throughout the park. At a stretch of ground behind the nature center that had recently been covered with wood chips, I counted 12 feeding together. 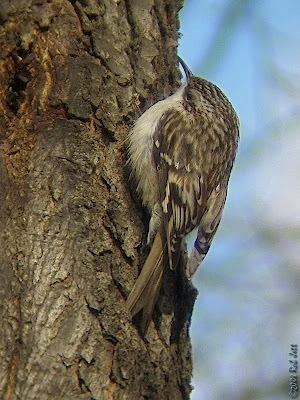 I spotted a Brown Creeper resting about six feet up the side of a tree trunk and was able to take a few photographs. Like sharks, they rarely seem to stop moving and are usually on the opposite side of the tree by the time I'm ready to take a picture. Before I left the park I stopped near Alice and Ralph's nest to watch for activity. I was leaning up against my bike and talking to Steve on my cellphone at 4:05PM when Alice flew over my head from the south and headed directly into the nest. She left the nest about 1 minute later and flew towards the Midwood. It was a complete surprise when, 2 minutes later, she was followed by Ralph leaving the nest. I hadn't noticed that he was in the nest during the 30 minutes that I had been monitoring it. Does that mean that Alice has already laid at least one egg and Ralph was taking his turn incubating it? I guess I should begin the countdown starting today. 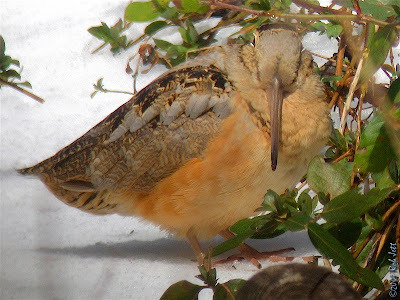 American Woodcock are early migrants around New York and the males begin competing for mates by mid-March. Last Sunday I went over to Ridgewood Reservoir with Scott hoping to find signs of their arrival. Lou, who lives close to the reservoir, met us there. Woodcocks are medium-sized, plump birds with a long, slender bill that they use to probe the soil for insects and worms. Their feathers are a cryptic blend of browns, rust and other earth tones that enables them to virtually disappear into a forest floor's leaf litter. These nocturnal creatures are rarely observed unless unintentionally flushed when strolling through the woods; even then, it is just a fleeting glimpse of their rear end before they drop back to the ground and vanish. Once a year, however, they make an exception to their reticence and announce their presence to anyone interested in watching and listening. Scott, Lou and I arrived at the reservoir at 6PM. Sunset would be at 6:56PM. We walked up the stairway from Vermont Place to the running path at the edge of the reservoir basins. Basin #3 is the south-most and largest of the three empoundments. Within basin #1 and #3's forested habitats include some small wet meadows. Wet meadows are the preferred staging ground for the woodcock's conspicuous activities. We stood at the edge of the chainlink fence that surrounds basin #3 and waited for the show to begin. Scott was setting up his camera, I was talking softly and Lou was quietly facing into the basin. It was getting dark, but there was still enough light that we could see the floor of the basin. Something flashed through the edge of my peripheral vision and I pointed my binoculars down into the artificial valley a few yards away from the base of the retaining wall. 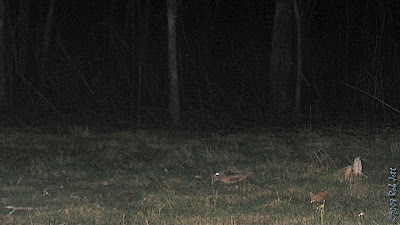 A woodcock had just flown out of his daytime roost and was slowly walking back and forth, probing the forest floor for worms. It was pure luck on my part, but I was able to get both Scott and Lou on the bird. He eventually wandered out of view and into the darkness of the young forest. Shortly after the sun went down, I heard the first woodcock's call. On Sunday, a strong wind was blowing towards the basin. The woodcocks launched themselves into the wind and directly over our heads. About twenty minutes after the sun had set we heard males peenting from three different locations within basin #3. Scott struggled with his video camera, trying to anticipate where the next twittering woodcock would appear over the running track. I couldn't decide whether to stand in once place or follow the peenting calls to the north end of the basin. After about 30 minutes of peenting, twittering and spiraling woodcocks, we decided to call it a day. Unfortunately, the future for this unique city habitat and American Woodcock display ground is in question as the department of parks wants to remove the forest and turn it into baseball fields. See the Ridgewood Reservoir blog for more information. I started off the first morning of daylight savings time with a day trip to Jamaica Bay Wildlife Refuge. Paige picked me up in front of my place at 7AM and, although I missed an hour of sleep, it felt good to walk outdoors into the sunshine with the clock shift's symbolic preparation for spring in the back of my mind. In only three weeks, day and night will be of equal duration, beginning the gradual advance of daylight until July. When I opened the front door and heard the calls of jays, chickadees and cardinals, it felt like my entire body heaved a sigh of relief, shaking off the sleep of winter. Every March I sense that the greening of Spring is just around the corner. 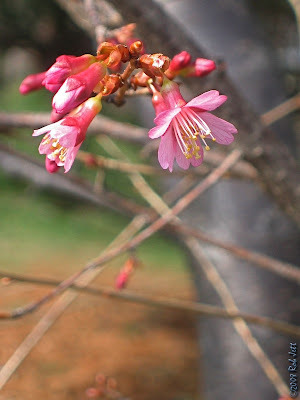 Today I noticed that small, ruby red flowers have appeared on maple trees. Silvery pussywillow buds have also begun to emerge on slender willow branches. Unfortunately, thirty mile per hour winds blowing in from the west turned the hope of a spring-like morning into a raw winter outing and reminded me that March can be cruel. The wind kicked up white-caps on Pumpkin Patch Marsh and the waters surrounding the West Pond. Several thousand scaup were concentrated into the lee at the southwest end of the pond. A flock of about a dozen pintails fed along the shoreline while most of the waterfowl slept with their heads tucked under a wing. Small flocks of Snow Goose arrived at the pond for a respite from the wind. A single Greater Yellowlegs stood in knee deep water, looking a little perplexed among the thousands of ducks and geese. Paige and I had begun the morning by walking through the windbreak of the North and South Gardens, hoping that songbird flocks were doing the same. We then continued around the West Pond in a counter-clockwise direction. At the first break in the trees at the edge of Pumpkin Patch Marsh I noticed a Peregrine Falcon perched on an Osprey nest platform. He visited us an hour later. We were approaching bench #2 and stopped briefly in the windbreak created by a tangle of shrubs and vines. Several black ducks and a small, unidentified duck had just taken flight and were heading south across the bay. In my peripheral vision, I saw another bird coming up low from the pond and heading towards the edge of the windbreak. I turned to look and realized that it was a Peregrine Falcon in hot pursuit of the ducks. The raptor either didn't notice us or just thought he could navigate around us because, as he passed by, he was so close that had Paige stuck her arm out, she would have struck him. I haven't a clue how fast he was traveling, but the event was so fleeting, that we stared at each other, with dumbstruck, did-that-really-just-happen expressions. There wasn't nearly the concentration of waterfowl on the East Pond, but there was a nice mix of species. Like on the West Pond, the birds avoided the strong wind by hugging the pond's western shore. The majority of the flock was scaup, but there were also shovelers, Canvasback, Ruddy Duck, Bufflehead and a single Redhead. From the blind located a short distance north of the Raunt, we noticed an unusual behavior by the scaup. Some of the low branches of a willow tree were hanging over the water. A small group of the scaup were remaining close to the branches. 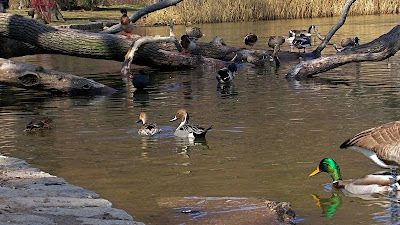 Occasionally, some of the ducks would stretch out their necks, grab something from the branches and eat it. At first it appeared that they were just breaking off bits of twigs. After watching them for a few minutes we realized that they were eating the willow buds. Capers? We made a quick stop at Big Egg Marsh where we observed more Snow Goose resting out of the wind. On the way back to Park Slope we stopped off at Floyd Bennett Field. 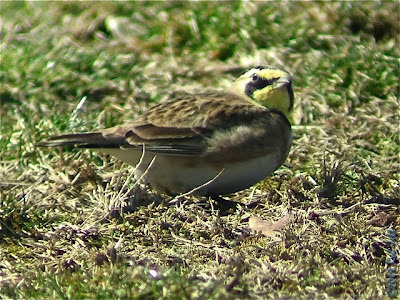 A flock of Horned Larks were on the grass at the cricket field. Unlike other species, they seem to enjoy the wind and were feeding out in the open. Something spooked the flock and they took off, heading in the direction of Flatbush Avenue. While we were trying to relocate them I noticed some birds near the fence at the western edge of the field. It was a flock of Killdeer. They blended into the surrounding earth colors so well that, as we counted then recounted, we kept finding more. The day's theme ended up being waterfowl and we ended up with a list of 19 species. The first time that I observed nesting Red-tailed Hawks was back in the mid-1990's. 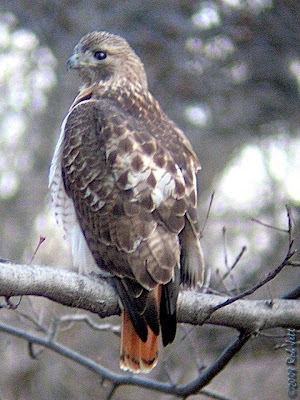 It wasn't until Big Mama & Split-tail began building their nest in Prospect Park during the winter of 2002 that I became a hawk devotee. I quickly learned that Red-tailed Hawks are intelligent, resourceful animals, but what I observed today was completely unexpected. I had a doctor's appointment late in the afternoon and decided to leave early, so I could walk across the park. My plan was to check the Ravine nest, and if there were no signs of change, I'd walk through the Midwood looking for a second nest. It's difficult to tell if Alice and Ralph have built up the Ravine nest, but I took a photo so I can compare it with Saturday's images. I walked along Center Drive and scanned the south end of the Midwood for hawks and nests. Alice was perched in a towering Tuliptree with something gray in her talons. At first I thought it was a rat, but it turned out to be a very young squirrel. Despite the fact the she was perched about 60 feet up, she seemed nervous while I was watching and jerked her head from side to side. After about a minute she moved to a perch near the top of the ridge at the west side of the woods. I walked through the Midwood forest and scanned for nests. The woods are dominated by mature tuliptrees and sweetgums. They have massive trunks and thick, spreading branches that would make an excellent platform for a hawk nest. I didn't find any and walked up to Rick's Place, turned left and followed the ridge above the Midwood to look across the treetops. At the point where the ridge begins to descend back towards Center Drive there is an opening in the canopy. It's one of Ralph's favorite spots and I've photographed him there several times. I wasn't surprised to find him there today perched on a low branch, directly below his mate of 7 years. He preened while Alice ate her squirrel. Suddenly, they both took off flying towards the zoo near Park Drive East. I heard them making a chirping call that is part of their bonding behavior. Maybe they moved their nest closer to the zoo. I walked back down to Center Drive and followed the sound of their calls to the fence that surrounds the zoo. Several years ago, Big Mama hatched three chicks in a nest near the zoo. Two became very ill and one of them died. The second one survived but was unreleasable, so they built an enclosure in the zoo for him where they use him for educational purposes. Last year the parks department announced that they had brought in a second Red-tailed Hawk which they placed in the same outdoor enclosure. When I arrived at the walkway a few yards from the zoo's fence, I spotted Alice and Ralph perched in trees above the hawk enclosure. The source of the amorous calls was neither Alice nor Ralph. 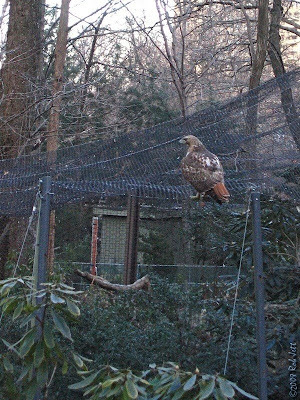 It was from a large, very dark (Western race) female Red-tailed Hawk within the Prospect Park Zoo's hawk aviary. The outdoor enclosure is constructed of a metal mesh that is suspended by cables, like a circus tent. I couldn't figure out if our resident hawks were "interested" in or just curious about the caged birds. The zoo was closed, so I stood up against the wrought iron fence, quietly watched and shot images through the bars. It only took a few minutes for me to decide what was on Alice's mind. As I watched, Alice and Ralph began to fly to perches ever closer to the aviary. Finally, with Ralph directly above the cage, Alice dropped down onto the top of the mesh enclosure and tried to attack the calling female. She hop-flapped to several spots on the black metal mesh looking for a way to get to the other hawk. In one corner of the enclosure is a four-sided plywood shelter where the zoo's hawks roost in inclement weather. The top of the shelter is only about three feet away from the mesh that separates the captive animals from Alice's protective instincts. At one point, the zoo's red-tail hopped up onto the shelter and was met by Alice directly above. 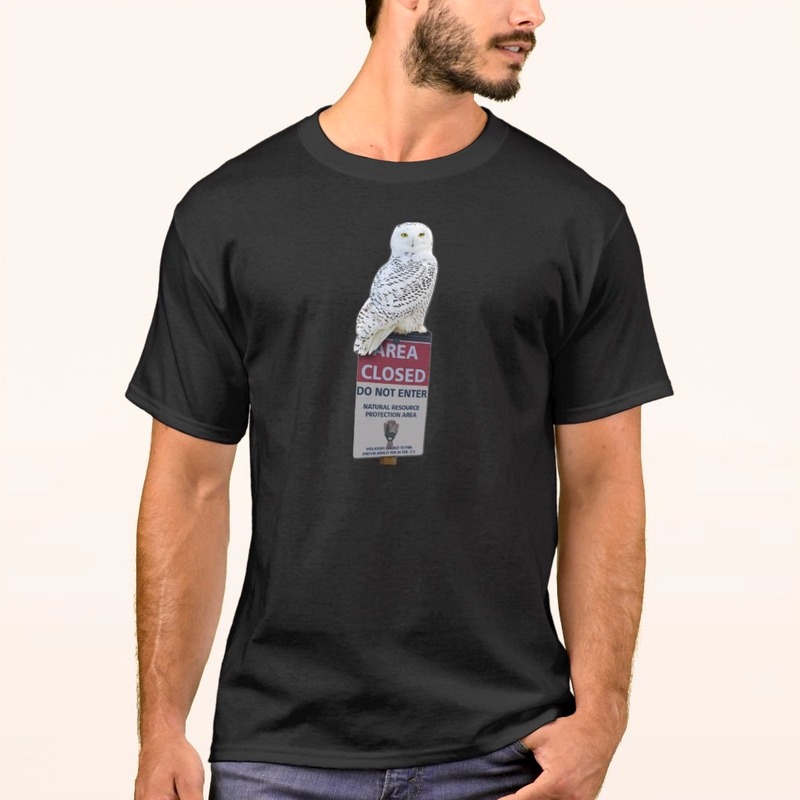 The chirping hawk flipped over and locked talons with Alice through the enclosure. She hung there for a second or two before releasing her grip. The intimidation by Alice continued for at least 30 minutes. There were times when she would stand above the caged female and, with her crown feathers raised, snap open her wings and lean forward. The other hawk would usually flinch and back down. Ralph had flown to a low branch about 20 yards from the enclosure and just watched. 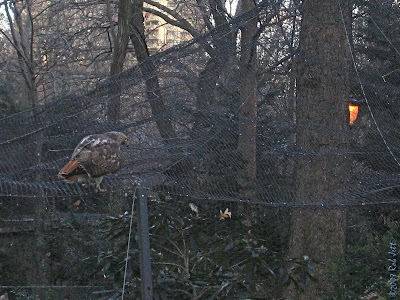 Finally, at about 5:30PM, Alice flew to a perch near the walkway and above the zoo's fence. She silently stared down at the captive hawks. A moment later Ralph flew to her perch and mounted her. When I left they were still perched, shoulder to shoulder, staring down at the hawk aviary. One unrelated observation was a Turkey Vulture soaring over the park at 5:40PM. I believe that it is the first migrating vulture to be seen in the park this season. Watch closely at the 1 minute mark, you'll see the female inside the aviary hang upside down for a moment. 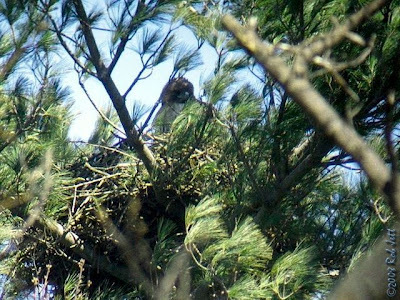 At about noon on Friday I walked up to the park to check on the hawk nest. Hawks will sometimes start work on one nest then change their minds and settle on another location. Alice and Ralph have been using the same pine tree location for 5 years. Scott and I did witness them working on it last week, but I wanted to be certain that they hadn't moved to another spot. 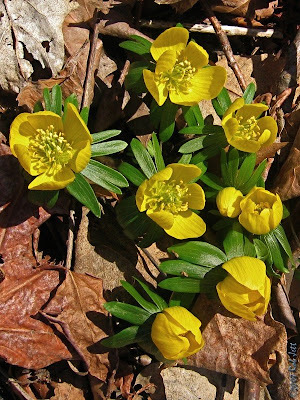 The Winter Aconite flowers on the south-facing hillside in the Ravine have opened creating a beaming, yellow patch along the mostly brown incline. Another yellow flower, witch-hazel, is also blooming. 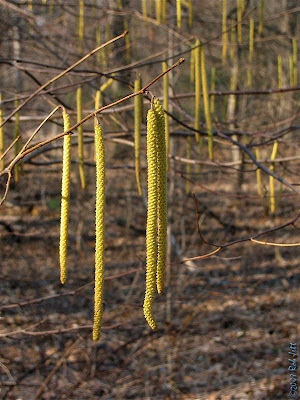 Unlike the aconite, witch-hazel is widespread throughout the park. 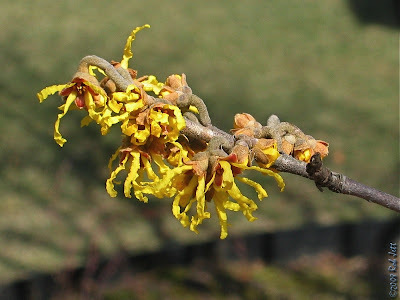 Within the next couple of weeks we should begin to see another blossoming yellow flower - cornelian cherry. I wonder if it's just a coincidence that the first flowers are yellow in color. I walked over the Boulder Bridge towards the Midwood. My thought was that from the top of the ridge I would be able to see the Red-tailed Hawk pair coming from all directions. There was no way for me to tell if they had added more material to the nest since my last visit. I sat down on a Black Cherry log to wait. 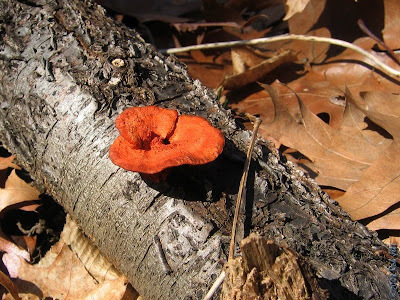 While waiting for the hawks I noticed that the one end of the log had a line of about 10 vivid scarlet fungi; Cinnabar Red Polypore. In the bright sunshine, their brilliance almost makes them look artificial. I had an appointment in the city, so I couldn't watch the nest for very long. There was no sign of the hawks for an hour. I went back into the park on Saturday morning determined to take some photographs of Ralph working on the pine tree nest. The weather was changing minute to minute. It started out sunny and warm, then the clouds rolled in and the winds kicked up. Ten minutes later the sun would be back out. For the three hours that I watched the nest, the clouds wavered from little, puffy patches to a thick blanket of gray. I found a spot to set-up my scope next to a boulder and in the lee of a large oak. There were large flocks of robins already migrating through the park. One flock of about 200 landed in a sweetgum tree. They fed on the few remaining berries from a bittersweet vine that had wrapped around the tree's trunk. I heard the brash "conk-a-reee" song of Red-winged Blackbirds in the cattails surrounding the upper and lower pools. I recognized the sharp "chack" calls from small flocks of grackles passing over my section of woods. Two hours and I still hadn't seen or heard the Red-tailed Hawks. Maybe it was still a little early in the season. 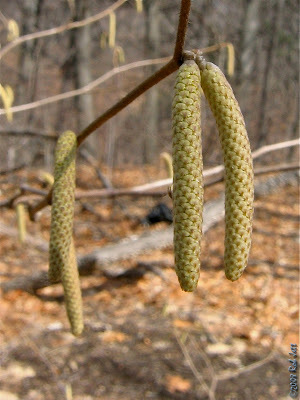 The alder shrubs in the forests have sprouted long, pale green catkins. At least they are right on schedule. I couldn't sit much longer, so I walked around to various other areas in the woods surrounding the nest. After 5 years, I'm pretty sure I've tried out all vantage points, but it wouldn't hurt to look one more time. Alice and Ralph had picked a perfect spot, that is if they didn't want anyone watching them. I can view the nest fine now, but once the trees leaf out, it's like they've pulled the drapes closed. After a 3 hour wait and no Red-tailed Hawks, I packed up my gear and went home. On Sunday, Marge and I went to look for owls. It's getting a little late in the season for Northern Saw-whet Owls as most have begun heading back north. I thought that there was a slight chance we could still find one. There were several location that we planned to check and we were hoping to find Great Horned Owl, Long-eared Owl, Northern Saw-whet Owl and Short-eared Owl. Out of respect to the owls and the ABA's Code of Birding Ethics I will not post any directions or locations of roosting or nesting owls. Suffice to say, it was a long morning but we did manage to see a magnificent Great Horned Owl. Before the sun set we drove over to the Green-Wood Cemetery. Big Mama and Junior's 2007 nest has fallen from the tree and they have not restarted another. We wanted to take a slow drive around the cemetery looking for a new nest. There is an impressive nest a short distance away, but Marge said they built it last year, then decided not to use it. Perhaps they will this year. While we were in the cemetery we drove over to the pond where the wayward Snow Geese have been staying. Three juvenile birds have joined the resident flock of Canada Geese and Mallards. 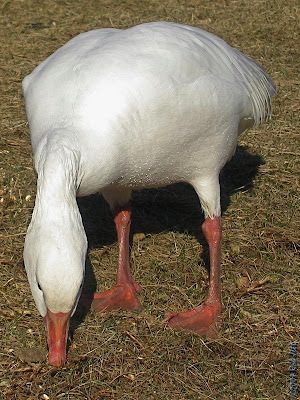 One of the Snow Goose had a severely injured foot. Marge tried to get it help, but was told she had to catch it, which would have been impossible. The poor animal lost the foot, but has survived. Marge brings him cracked corn and watches him eat as he is considerably thinner than the other geese. I sat on the ground next to this wild bird and watched the interaction of his flock-mates. I was intrigued by what I observed. 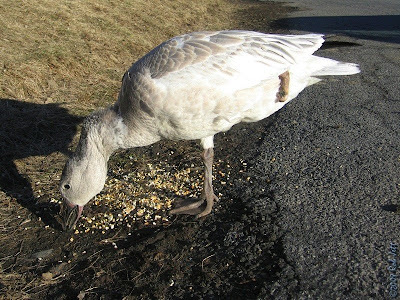 Two years ago a Snow Goose with an injured wing appeared in the cemetery near one of the ponds. Her prognosis did seem very good, but Marge kept an eye on her and brought the occasional cracked corn treat. Most of the Canada Goose were relentlessly mean towards the injured bird. They bullied and chased her away from Marge's offering. Her wing has healed, somewhat, and she has learned to stand up to the threats of the larger geese. Then one day another injured Snow Goose arrived at the same pond in the cemetery. I would think that the, now healthy, adult Snow Goose would look after the younger bird. Guess again. If I hadn't been sitting protecting "Stumpy" while she ate, the older goose would have chased her away. At times, even when I was sitting only 2 feet away, that ungrateful Snow Goose would try and intimidate the poor thing. Some Mother Goose she turned out to be!